Here in Gatlinburg, TN, we have more than just awesome sights, cool shopping, and nifty, family-centered attractions. We have a slam-dunk way to access all of it: by trolley bus. 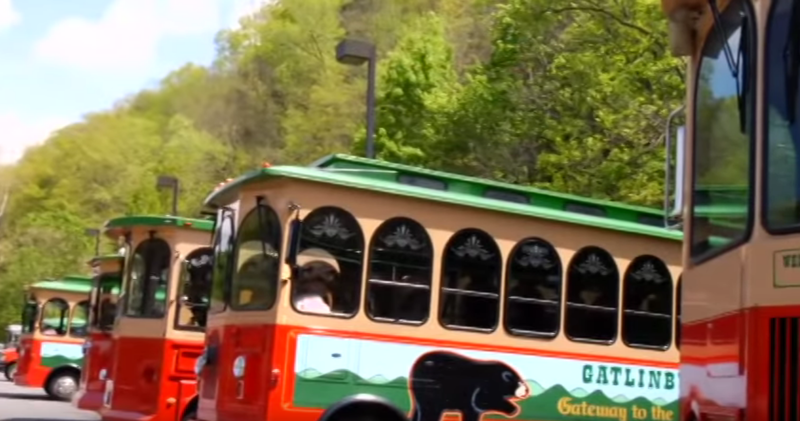 Starting June 17 through August 14, Gatlinburg will be offering complimentary summer trolley service at all stops along Parkway, the city’s vibrant main strip. This is the sixth year Gatlinburg has offered the free service and, thus far, it’s the toast of the town. You’ll see these specially painted trolleys cruising up and down the thoroughfare carrying a mix of eager tourists and local residents. When you’re aboard and seated, you’ll quickly discover how quickly everything gets easier – your bags, your schedule, your time. Time to enjoy the view and let someone else drive. Freedom to hop off and stroll, or hop back on and cruise. You can do the whole strip with the trolley buses right there at your service to help you along the way. Allow the sights to fill your eyes as the trolley drivers fill your ears with the best of where to go and what to do. The drivers are talkative, informative and friendly. Traveling by trolley, you can visit shopping centers, family attractions, and mom & pop boutiques along the Arts and Crafts community scenic loop – off Parkway, trolleys are no longer free, but they’re amazingly cheap and they go everywhere. Parkway itself empties out at the entrance of the Great Smoky Mountains National Park. When you’re ready to see more, set your sights beyond the confines of the grand old promenade and strap yourself in for some adventure. A $2.50 all-day pass grants you access not only to trolleys in Gatlinburg but to those in neighboring cities of Pigeon Forge and Sevierville. And there’s no need to memorize names or numbers or routes. Just grab a map and follow the colors. All routes and corresponding trolleys are color-coded, which makes traveling around a snap! The nimble fleet of trolley buses and their cordial drivers are at your service as you make your way around the tri-city area and take in the best of the sights, eateries and shopping. The transit system comprises 50 miles of routes linking numerous popular destinations – there are more than 100 stops along the way. See our Trolley Information Page for full details. You’ll love the freewheeling feel and beautiful scenery. The trolleys offer a smooth ride and are equipped to accept handicapped riders, wheelchairs, bicycles and even baby strollers. So, hop to it and trolley along in comfortable, air-conditioned style.